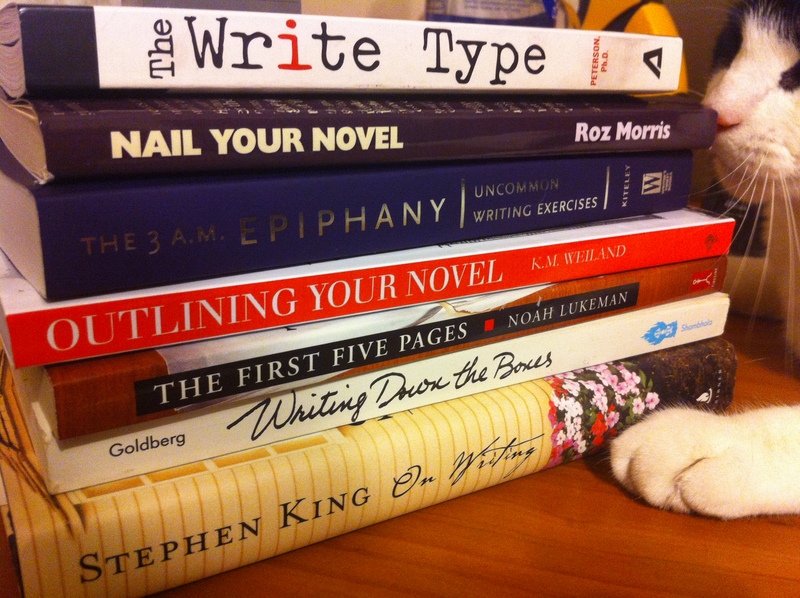 Stack-o-writing- books: Hansel-cat inspects them for safety. Part of my ongoing attempts to be a better writer, was to start incorporating writing exercises to my daily life to help grease the writing wheels. Hence afore mentioned books. It has been a very long time since I have taken any formal writing or English classes so I hopped on Amazon to see what kind of writing books they had. I am hoping these will all be useful. Anyway, I am planning on writing reviews on the various books I am reading. This will include non-fiction goodies like the books pictured, various items read for research and inspiration, and also the various books I read for fun. DISCLAIMER: My tastes run rampant as far as what I like to read so keep an eye out for reviews. You never know what you are going to get! This entry was posted in Blogging and tagged amazon, Blog, Blogging, karen e peterson, literature, natalie goldberg, Reading, Writing, writing down the bones, writing exercises by Writer Owl. Bookmark the permalink.